The interweb home of two best friends born a day apart. When I was little my Mom used to make pizza dip for football parties. I have watched her make it so many times but somehow I messed it up. Don't use this recipe, try a different one. Warning: I do not recommend this recipe. This is just here for scientific purposes. Will try to get Moms recipe soon. 1. Mix cream cheese with Italian seasoning and salt and pepper to taste. Spread on bottom of glass smaller rectangle Pyrex dish. 2. Pour some sauce over the cheese mix. 3. Layer with muenster cheese slices. 4. 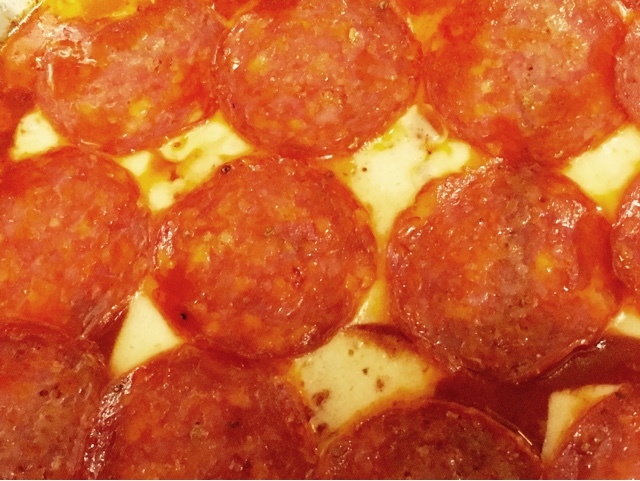 Cover with lots pepperoni. 5. Be sadly disappointed that it doesn't taste the way it's supposed to. If anyone has a good recipe for pizza dip let me know! I mostly followed a few different recipes other than the cheese recommendation. The Munster I get basically tastes like fancy mozzarella and I use it on pizza and pasta so I don't think that's the culprit. Maybe I used low fat cream cheese on accident. That stuff is never as good. Hubby thinks I may have used to much pepperoni but I didn't think that would be possible. Come to think of it my Mom doesn't put pepperoni on hers... At least the kids liked it lol. Labels: food, pizza dip, too much pepperoni?